Do your wire rope needs include a combination of corrosion resistance, strength and versatility? 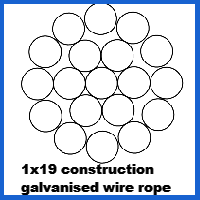 If so you might consider investing in our 1×19 galvanised rope with a diameter of 10mm. 10mm 1×19 Galvanised Wire Rope is capable enough to conquer many different tasks and can be turned into a unique assembly by our engineers. With a thickness of 1 centimetre, you could be forgiven for assuming that this galvanised rope is relatively weak. Thankfully this is a common misconception, since its 1×19 strand structure is deceptively sturdy. The maximum achievable load capacity is close to 10.5 tonnes and it is also resilient in the face of breaking forces. Also worth noting is the anti-corrosion coating that is created during galvanisation. The wire strands of the rope will remain clear of rust, regardless of the atmospheric conditions to which they are exposed. In addition to many types of galvanised rope, our range includes a huge number of other options for customers across different sectors. Non-rotating rope produced at our facility is useful for making some types of lifting operations safer. Stainless steel rope will not corrode and has an attractive aesthetic to consider. You can call or email Rope Services Direct with questions about our products, queries about our pricing and to get help with choosing wire rope. Our sales hotline is 01384 78004 and our contact page features an email form to which we aim to issue responses rapidly. 10mm 1x19 Galvanised Wire Rope Overall rating: 5 out of 5 based on 6 reviews.